Samuel Bland Arnold was born on September 6, 1834 to Benedict “George” and Mary (Bland) Arnold. In his early days, he and his brother William attended St. Timothy’s Hall, a military academy in Catonsville, MD. St. Timothy’s was a firm school requiring the students to wear steel-grey uniforms and maintain strict military discipline. In 1852, Sam and Billy became introduced to a fellow student, John Wilkes Booth. Booth was not the best of students, fighting against the regimental nature of the school. The death of John’s father in November of 1852 put an end to his time at St. Timothy’s. Sam, on the other hand learned well from his time at the academy. When John Wilkes Booth was developing his career as an actor, Sam signed up for service in the Confederate States of America. He joined the First Maryland Infantry in 1861 before he was discharged for illness. 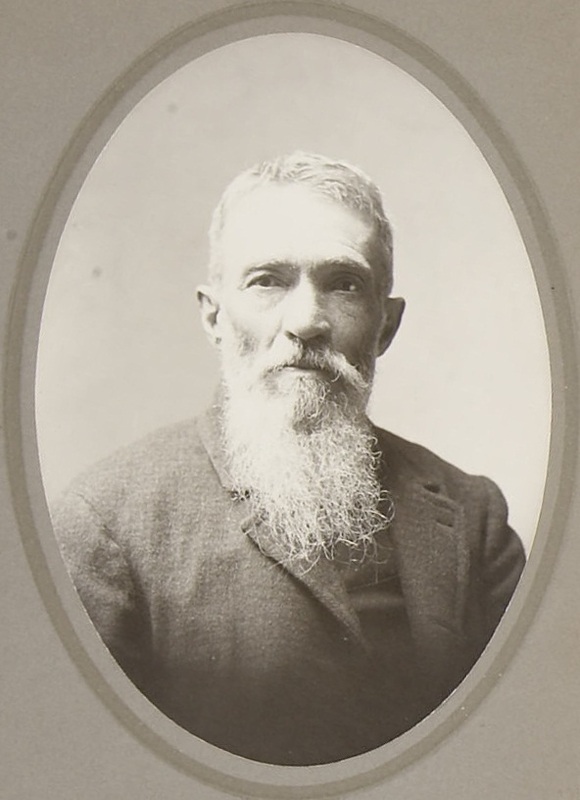 He later joined another brother, George, who was serving in the Nitre and Mining Bureau in Georgia. He left this position in early 1864 to care for his ailing mother in Baltimore. 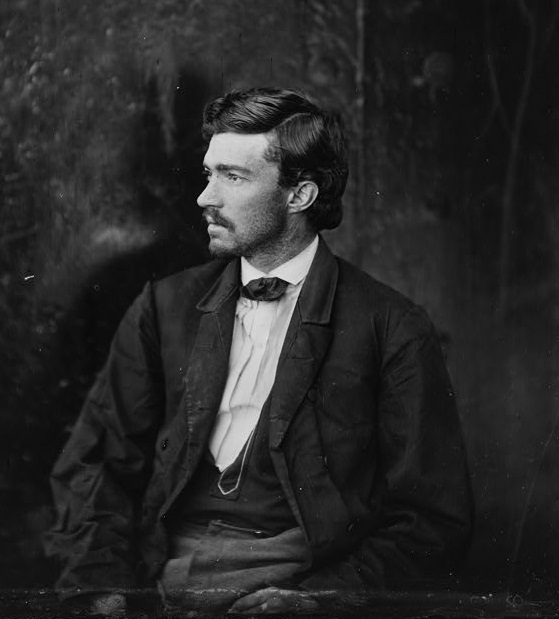 In August of 1864, John Wilkes Booth happened to run into his old schoolmate, William Arnold in Washington, D.C. William said that his brother Sam, a veteran of the CSA, was also in D.C. at the time, and he arranged a meeting with him and Booth. The two old schoolmates quickly rekindled their friendship over drinks. During their meeting, another of Booth’s childhood friends, Michael O’Laughlen, appeared, having been invited by Booth. After a bit, Booth brought the two men into his confidence about his plan to abduct President Lincoln and hold him for ransom. Arnold and O’Laughlen, both influenced by and sharing in Booth’s dream for a drastic turn in the war, pledged themselves to help Booth fulfill his goal. This support in the kidnapping plot and an ambiguous letter from Sam found in Booth’s room would prove his undoing. After the assassination, Sam Arnold was sentenced to life imprisonment at Fort Jefferson, Dry Tortugas. Yes, it appears that the Samuel Arnold that died on October 7th was not the Sam Arnold involved in the conspiracy. Rather he was just a man that shared the same name as the conspirator. As Osborn Oldroyd had written, the real Sam Arnold had already died. He did so quietly and without any statement having been released upon his death. And so the world was left without ever hearing the words of the last Lincoln conspirator tried by military tribunal in 1865. All of this breaking news about Sam Arnold’s death proved confusing to a 68 year-old resident of Friendship, MD. Arnold’s account became a daily column for two weeks in many national newspapers. Most of his account detailed his imprisonment at Dry Tortugas. In 1995, author Michael Kauffman reprinted the account as the book Memoirs of a Lincoln Conspirator. It is an essential, albeit biased, version of the conspiracy that led to Lincoln’s assassination. The real Sam Arnold actually died on September 21, 1906 at the home of his sister-in-law Helen Arnold. He is buried in Greenmount Cemetery in Baltimore. 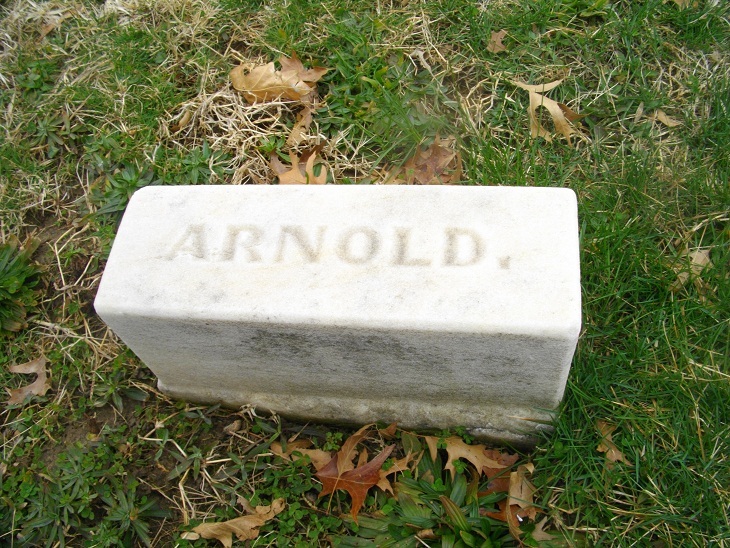 His nondescript “Arnold” stone rests in the same cemetery as John Wilkes Booth and Michael O’Laughlen, recreating his visit with the two men so many years before. Post Script – Even after the mistakes that were made when the other Sam Arnold died, the press still made mistakes when the real one passed on. For example, did you know the conspirators were imprisoned in Hawaii? Indeed a interesting fellow…I watched Brad Metzers decoded and he was mentioned got my curiosity peaked so had to read up. Dave, I am really, really impressed by your research and the educational value of your new blog. This is a wonderful addition to the Internet and furthers my belief in the net being a wonderful educational tool. I am going to spend some time over the next few days adding individual links to your articles. I was not familiar with your format, and stupid ol’ me did not realize each article had its own individual URL. I previously thought I could just link to your home page. I now see I was wrong. My site is used in many, many schools, and I think I can help make students, teachers, librarians, parents, homeschoolers, etc. more aware of your site by adding these links to individual pages within my site. A lot of your material is covered in a general way on my site – your articles add all the fascinating details I don’t have. I keep track of all my site’s stats, and right now there are exactly 6,841 other web pages that have links to my home page. This doesn’t include thousands upon thousands of additional links to the other 289 separate URL’s in my site. Thus, I am convinced that by adding links to your site I will be able to send lots and lots of new visitors your way. This won’t be so apparent in the summer when school is out. Visits to my site really go down in the summer, but then pick up when school starts in the fall. And February is by far the most active month. All I am trying to say is I feel your site is a wonderful place for students to be, and I am going to do my best to make schools aware of this. Kudos on what you are doing. The effect of these additional links I add will also send many adults to your site as well. My site isn’t used exclusively by students. Very good synopsis of the Arnold story – and I did not know that one press source printed his death site as Hawaii. They couldn’t get things right in the old days either! I also agree with Roger that your site is an excellent source for students to learn about the assassination. We have made a special announcement on the Surratt House website about it and listed it in our web links section. More power to a real scholar. Thank you Laurie for putting my blog up on the Surratt.org website with such a kind endorsement. While Roger’s site has the most information online, we all know that you and the Society are the gatekeepers to the assassination story. I forgot to mention in my first reply that everyone surely noted Sam’s father’s name was “Benedict Arnold.” One of the original Boothies of the 1970s is Percy (Pep) Martin who actually traced the family back to the infamous traitor of the Revolutionary War period. Another example of six degrees of separation when it comes to history. Thank you so much for your kind words. The conspirators were quite an interesting bunch and I’m glad you’re enjoying the blog. You are far too kind. Thank you for your continual support and encouragement regarding my work. My opinion has always been that yours is the best site about the Assassination and everything else Limcoln as a matter of fact. I consider it a great honor that you feel my blog is worthy of connecting to your award winning site. Please keep up the great work! You’re making this blog into a wonderful experience for scholars and students alike! Thanks for the articles, Betty. You rock! I bought the book you referred to by Arnold, Memoirs of a Lincolln Conspirator two weeks ago at the Surratt House Museum (they have a great book store). Your article is a such good addition and explanation to the events at the end of his life that I am going to print it off and place it in this book. The quality of your photographs are great too. As I have mentioned to a few of the others who have left replies on your site, I would like to see you and Roger organize an annual tour during the summer of New Salem and Springfield. Please seriously think about it before I get to old to go up and down the bus steps. 2013 would be a good target date. I’m very pleased you find the blog helpful, Gene. At the very least it’s good to know I provide good bookmarks. While an Illinois native, I only did the bus trip to Springfield once, as one of those annoying eighth graders. I would be I’ll equipped to speak on the living Lincoln. I focus exclusively on his latter days. Rogers’s the real expert. Dave, many thanks for your kind words. Helping students with their research through my website has “saved” me in retirement. I tell my other retired friends – start a website on your favorite topic and offer to answer questions that come your way through the site. The good feeling of helping others is overwhelming. I have even talked to my family physician about this as he is worried what he’s going to do in retirement. He may actually do this – create a medical website on a very specific health problem and offer to help people online who write him. Hey Gene. I noticed you have a Fido avatar on another forum. I bet you know how Fido died, but in the unlikely case you don’t, here goes. I know from talking to teachers in the primary grades that my Fido page has been used in classes in schools by very, very young children. Thus, I purposely leave the specifics of Fido’s passing off my Fido web page. knife into Fido’s body. The poor dog struggled to return home but couldn’t make it. He crawled into the shade under Springfield’s old Universalist Church on the corner of 5th and Cook Streets. There the dog laid down to die. He was later found by the Roll family who had been caring for him. I love animals, and I get quite emotional when I think about this. Roger, how sad! I just googled mapped the address and saw the street view of where Fido breathed his last, though I am not sure which corner. My information is the northwest corner of that intersection. That is a very sad ending for a presidential pet. I remember when I visited the Newseum a few years ago they had a small exhibit about the different pets, I don’t recall reading about Fido’s heart breaking demise. Dave: Always interesting, and so glad you are moving to the free state. The reference to be nearer the “woman you love”………Is that Laurie Verge?